Jay Bakker lives in Williamsburg, Brooklyn, where he is co-pastor of Revolution Church NYC, a church that meets in a bar and has a strong online following. Jay speaks to congregations and other groups all over the country about faith, grace, and his experiences with the underside of life and Christianity. 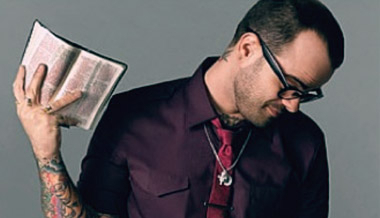 Jay has authored the books Fall to Grace and Son of A Preacher Man. Uhhh...Jay Bakker on art, justice and spirituality. Hugh Hollowell and Jay Bakker chat about love, faith and hope.